“Nexus is a Toronto-based percussion ensemble that has been making hard-to- classify music using a massive array of instruments for over three decades. ….The history of Nexus is in part a story of how “world music” traditions–from Africa, from India, from Indonesia, among many other places–have influenced and shaped the practices of Western percussionists and percussion music in general. Once upon a time, this kind of cultural encounter would have been called fusion, but the work of Nexus reminds us that all music is world music, blendable and blending together in one big sonic stew. 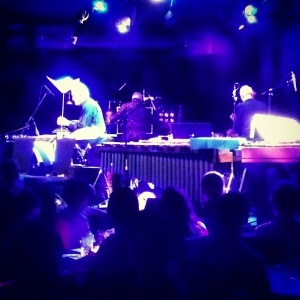 To illustrate, consider Nexus’s hour-long, non-stop set at Le Poisson Rouge in New York City earlier this week. They began with Fra Fra, their adaptation of a sequence of Dagomba rhythms…played on talking drums, gun-gon (a buzzing bass drum), shakers, and a whistle. Then it was off to Zimbabwe for a rendition of a traditional Shona mbira (thumb piano) piece …[that] faded into a long stretch of free improvisation, with each musician playing a small collection of instruments ranging from gongs…to bird whistles. It was during the bird call moments especially that Nexus’s subtly deep musicianship reminded the audience of the startling things that can happen when we listen… micro sounds, quiet sounds, overlapping and uncertain sounds in close dialogue with one another that seem to surprise even the performers themselves as they’re making them. That’s a musical lesson I really want to remember. Check out the full article by clicking here, and enjoy some great insights into world music, NEXUS, culture and sound. Hope you were there! If not…..Next Time! NEXUS in NEW YORK CITY June 18th ! !